Quick Link: Change my UMICH password now. Forgot your UMICH password? See Resetting a Forgotten UMICH (Level-1) Password for how to reset it. Choosing a strong, secure password reduces the risk that your password will be guessed or stolen by a password thief. A password thief can use your password to access your email and send email in your name, change your personal information in Wolverine Access and the MCommunity Directory, or publish inappropriate or illegal material. A thief may also be able to use your password to break into U-M systems. A strong, secure UMICH (Level-1) password is good for you and the U! When you change your password using UMICH Account Management: Change Password, your new password will be checked for strength. Use nine or more characters. Be a word or simple phrase—or contain four numbers in ascending or descending order (for example, 12345 or 8765). Use parts of your name. Use the first letters of the words in a phrase to make a strong and memorable password. For example, "Four score and seven years ago our fathers brought forth" becomes 4S&7yaofb4th. Select a unique password for U-M use. Do not use your UMICH password outside the university for other computing accounts. The university uses strong encryption methods to protect your password. If you use that same password for services that do not offer such protection, you put your UMICH password and account at risk. 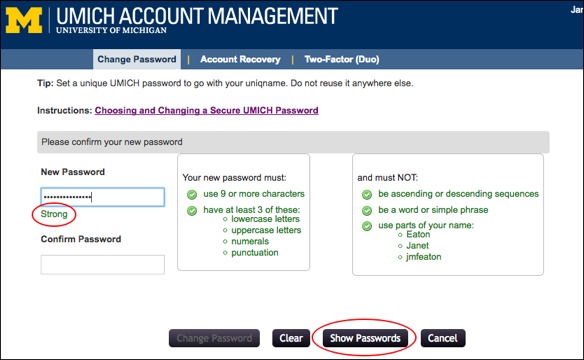 Michigan Medicine Only:You can log in to your Michigan Medicine profile page to change your UMICH (Level-1) password. See Michigan Medicine Knowledgebase: Level-1 UMICH Password for instructions. Go to UMICH Account Management: Change Password and log in. In the New Password box, type your new password. The strength of your new password will be checked as you type. As you meet each password strength requirement, it will be checked off in the box at right. For example, as you enter more characters and meet more requirements, you'll be notified that your password is strong. Tip:Click Show Passwords to see your password as you type it. In the Confirm Password box, retype your password. The word Match will appear next to it when you have correctly confirmed it. Then click the Change Password button. Wait for "Match" to appear. If you copy and paste your password into the Confirm Password box, it may not show Match immediately. You must type something in the Confirm Password box before a match will be registered. You will not be able to change your password until the word Match displays. Next, you will see a page indicating that your password is being changed, followed by confirmation when the change has been made. If you are using a shared or public computer to change your password, close your browser and log out of the system after you are finished. Your new password must synchronize to several systems. When you change your UMICH password, you are actually changing several passwords at once. Your password change is synchronized to U-M systems and services by the UMICH Password Hub in MCommunity. Please be aware that the synchronization is not instantaneous. It can take several minutes for the process to complete and for your new password to work for some services, such as MWireless. Please wait a few minutes and try logging in again if your new password does not work immediately. Lock the computer by pressing ctrl-alt-delete on your keyboard, then clicking the Lock this computer link. Unlock the computer by pressing ctrl-alt-delete on your keyboard, then log in with your uniqname and UMICH password as you normally do. If you have stored your password on your phone or other mobile device, be sure to update your device with your new password. For example, if you access your U-M email on your phone, you will need to login to the email application with your new password. You may also need to re-enter your password for MWireless. You will be able to reset your forgotten UMICH (Level-1) password yourself if you set up account recovery information ahead of time. We can then send you a password reset code at the email address you provide if needed. See Set or Change UMICH Account Recovery Information for instructions. Turn on two-factor (Duo) for Weblogin. Your password needs a partner. Don't tell anyone your password—not even trusted family members and computer support staff. Use a different password for each online account. That way, if one password is compromised, your other accounts are not at risk. It is especially important that you refrain from using your UMICH password for non-university services. Use only secure programs when connecting to the U-M computing environment—programs that protect your password and your data. If the service provides a logout feature, use it every time you exit the service. We recommend that you check your UMICH password security from time to time and change your password if it is at risk. If you must write down your password to help you remember it, it is better to write down a clue to jog your memory rather than the actual password. Keep it in a safe, secure place, and do not leave it where others could see it. Learn more about managing passwords at Safe Computing: Manage Your Passwords.